“Dad look at me, look at me, look at me WITH YOUR EYES!! !”, I swung my head around to look, interested at my sons request. There he was, having completed a 40 piece puzzle in no time at all. My three and half year old son, I was struck. “When did learn to solve puzzles let alone by himself?” I thought. Over the last few years as I’ve settled into my role as dad, I’ve made it a point to stop and to roll around on the floor with my boys and play. I do this because I overwhelmingly know that these early years progress so quickly because parents are usually trying to establish their careers, pay off their debts and all the while trying to catch their breath whilst raising a young family. 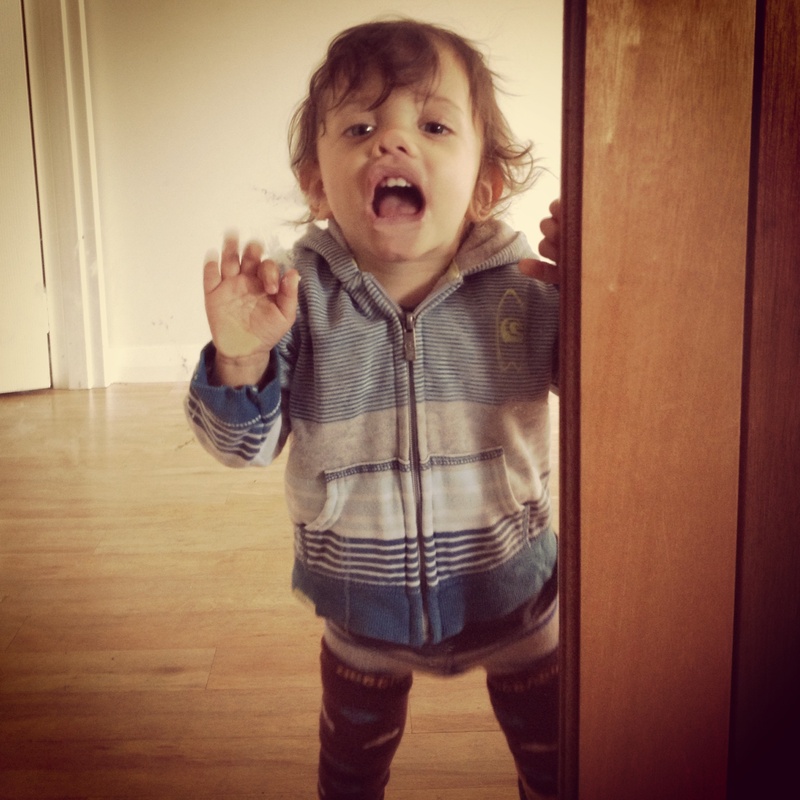 This picture is 18month old Hunter with his face glamorously pushed up against my study door…. I looked at this a few weeks ago and felt sad, mainly because I was so focused on passing my Fellowship Exam and believe I missed out on classic moments like these with my little lion. Taking heart to reprioritising my life and actively reducing my work demands has been life altering. I know that most dads may not have the opportunity to reduce their work hours but SLOWING down the race to financial freedom and to career and business success has been life transforming. But change can only arise from asking important questions about the direction of our lives and having the courage to change course whilst we have OPTIONS and TIME. What I know is this, if we fail to see where the trajectory of our current habits, decisions and lifestyle are taking us and are too afraid to question about where we are going, we are definetly going to face tough decisions and circumstances in the years to come. I unquestionably know now that the trajectory of my priorities were leading me away from an close relationship with my boys and creating increasing friction in my marriage. Its been tough and although i’ve made immense changes and seen the rewards, I still struggle everyday! I believe there are two pathways to change, the first is failure (topic for another post) and the second is recognition. The best way to recognise is to ask the right questions, or be asked! These are questions that I’ve asked myself over the last few years. They’ve all been derived from books that I’ve read, patients whose lives I’ve learnt from and hard conversations that I’ve had with my wife, close friends and mentors. Take the time and write down some answers. Then ask “Is what I am doing now going to take me to where I want to go?” and “what can I change to allow me to arrive at my destination?”. Do I carve out time weekly to play with my kids? Do they know what is important to me? Do I know what my kids are into and what their play entails? Do I know my children’s friends and what is happening in their little hearts? Do I know how my children experience love? Is it by touch? Is it through gifts? Is it through words of encouragement? Are you too harsh on them? Are you teaching them how to handle money correctly? Do you tell them that you love them? Do they see you express love to their mum? When did you last sit down and talk to your best friend? When was the last time we dated and kissed like we meant it? What is happening in her life? What are her worries? Are you doing anything that is hurting her? Do you need to change? Have you asked for forgiveness for your past actions? What are her greatest needs? Does jealously play a part in your relationship? What are you hiding from her? Do you relieve her and give her kid-free and husband-free time? Do you exercise regularly (30mins most days)? Do you have any secret eating binge habits? Is there a lump or bump, bleeding, weight loss, changing mole, blood test, examination that you haven’t seen your doctor about? What does your work need from you? When you are there are you doing a remarkable job or just getting by? Does your work line up with your passion or do you dread Mondays and live for Fridays? Are you doing anything to improve yourself and make your time more valuable? Are you working too much that your family is being cheated? What is your debt situation like? Are you constantly worried about what is happening that it robs you of joy each day? Are you regularly saving and paying yourself first? How much money do you need at the moment? Can you work less and spend time at home during their younger years? What can you do to increase your hourly rate and thereby spend more time at home? Do you have clear financial goals or do you believe in the lottery? Has someone hurt you that you need to talk to a counsellor/psychologist/friend/pastor about? Is there someone that you haven’t forgiven and their offense plays over and over in your head day after day? Have you hurt someone that you need to say that you’re sorry and build trust again? Are you dealing with a secret addiction that constantly occupies your thoughts? If this list of questions made you feel uncomfortable, thats okay, I ask uncomfortable questions for a living! Taking that uncomfortable feeling and translating into action is one of the best moves you can make. Remember that being cautioned now is far better than picking up the pieces later. “Daddy look at me” has a far deeper meaning than the momentary glance of approval and recognition. As adults our minds are often full of to do lists, insecurities about the future and overloaded with stimuli that rob us of the joy of the moment. Asking the right questions helps to block out the noise, focus on our one thing and to make lasting memories with our family. 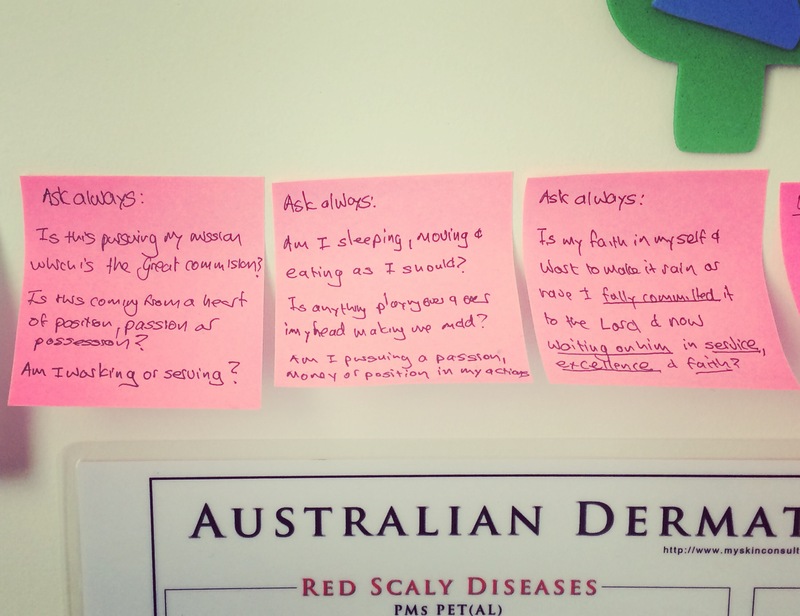 This is a picture of my current list of questions which i’ve placed above my desk so I see them every morning. These form the reference point for my life at the moment and highlight the areas that I am working on. Live intentionally. Asking the right questions WILL change the course of your life. Very interesting reading as usual Jonathan. I’m never too old to learn something from what you write about , thank you. Dear Janet thank you for reading and taking the time to comment. It’s been a while but I’m humbled that my writing still finds favour!